Body Balance is easy to mix. 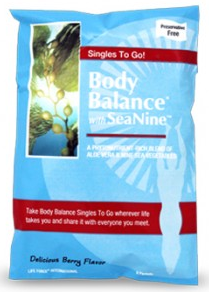 Body Balance powdered stick packets are great to toss in your pocket, purse, desk or travel bag. The revolutionary concept of combining two of nature's most nutrient-rich land and sea plants has made Body Balance a proven daily wellness leader for over 30 years. Today, it remains a nutritional powerhouse delivering a broad range of minerals and phytonutrients ideal for supporting each of the body's core systems. As a daily health foundation leader, we continue to source only the most potent, nutrient rich ingredients for Body Balance, including our own proprietary SeaNine blend of nine wild, sustainably harvested sea vegetables, and Aloe vera grown and processed according to USDA National Organic Program standards and certified by Quality Assurance International (QAI). As the mineral riches of the earth are washed into the oceans and reclaimed by sea vegetation we capture them in our SeaNine blend utilizing all three varieties of red, green, and brown sea vegetables. To protect the over 75 nutrients and 200 active compounds, including 12 vitamins, 20 minerals, and 18 amino acids found in Aloe vera, our inner leaf fillet is carefully harvested and processed under low temperatures. Since the 2011 Fukushima Daiichi nuclear disaster, concerns have been raised over the levels of radioactive contamination present in and around the coastal waters of Japan. 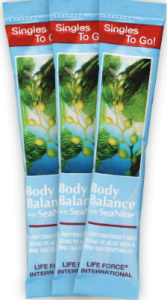 Life Force International's SeaNine blend contains a unique combination of nine sea vegetables harvested primarily off the east coast of Canada. As part of our rigorous quality control program, every incoming lot of raw material is tested to ensure the material's identity, strength, quality, and purity are in line with Life Force International's standard of excellence. In this regard, since 2011 every incoming lot of SeaNine blend has undergone a full gamma radiation test. Species of sea lettuce are incredibly popular in Scandinavia, Ireland, Japan, and China. Concentrated in protein, dietary fiber, and an array of vitamins and minerals, Sea Lettuce offers an abundant source of antioxidants and health-preserving compounds with a delicate flavor and vibrant color palate. Red marine sea vegetables have been used for thousands of years around the world for their high nutritional content, including concentrations of trace minerals absorbed from the ocean. Red sea vegetables are a rich source of phytonutrients, essential fatty acids, fiber, protein, complex carbohydrates, and minerals. Invaluable in boosting the immune system, red sea vegetables may also improve the body's response to infection. Researchers praise red sea vegetables for their bio-available compounds, and maintain that they may also prove useful in aiding weight loss and detoxifying the blood. Known by some as the &quot;king of seaweeds,&quot; Kombu is a brown type of kelp that grows in long narrow blades (up to 6 feet long), in dense forests below the tide. A rich source of iodine, Kombu has been used to treat thyroid dysfunction. It contains concentrated amounts of calcium, potassium, magnesium, trace minerals (including copper and zinc), as well as chromium. 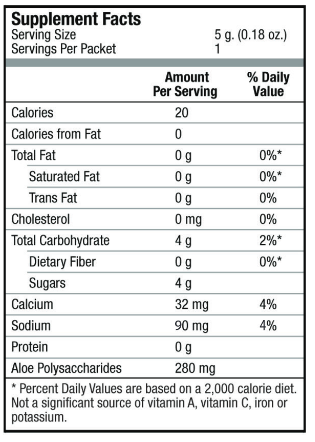 Incredibly low in calories, high in fiber, and delicious, Kombu has been a staple the Japanese diet for centuries. Honey is the concentrated nectar of flowers extracted by bees. It contains a variety of flavonoids and antioxidants which work to scavenge and eliminate free radicals and is also a natural sweetener. Life Force uses organic honey that has not been pasteurized. Gigartina Chamissoi is a leafy red seaweed containing a plethora of beneficial polysaccharides (carragreenans). Scientists have discovered that these carragreenans may possess some unique medicinal properties. They have found them to be antibacterial as well as antiviral. In fact, carragreenans may also be anti-herpetic (able to kill the herpes viruses) and anti-coagulant. Dabber locks or winged kelp grows in branched hold fasts where its blades have a distinct wing at the base. Found along the Artic to the northeast of the United States, Dabber locks are high in Vitamins A, B6, B12, and K. In addition to iodine and bromine, Dabber locks contain soluble nitrogen, cobalt, nickel, and other essential trace elements. Brown sea vegetables thrive in lush underwater forests, and purport tremendous nutrients and compounds. Touting a powerful nutritional composition, brown sea vegetables are incredibly rich in magnesium, protein, Iodine, phosphorous, brown sea vegetables also contain Vitamins C, K, E, as well as zinc, sulfur, silicon, iron, copper, cobalt, boron, radium, and ultra-trace minerals. Whether drinking the liquid or powdered Body Balance youâ€™re getting the same potency and the same high quality ingredients. Both formulas use ingredients which are processed to retain the naturally present phytonutrients, enzymes, amino acids, vitamins and more. Just as with our liquid Body Balance formula, the Aloe vera used in the powdered formula uses only the potent inner leaf fillet. Beginning with freshly harvested leaves, the inner gel (fillet) is carefully removed to minimize disruption of the Aloin layer so that the Aloin is not included with the inner gel as it can cause gastrointestinal upset when ingested. Aloe vera contains over 75 nutrients and 200 active compounds, including 12 vitamins, 20 minerals and 18 amino acids. Scientific studies have shown that Aloe vera contains many biologically active molecules, and is considered one of the most beneficial and useful botanicals on earth. It has demonstrated many important health-supporting benefits, including immune support, increasing bioavailability of nutrients, and support of GI health and digestion.